I am not necessarily stuck with 9mm, its just what my EDC takes and I'm a sucker for continuity. my wife carries a Kimber micro .380 and loves it. DA/SA or SAO is my main preference. Caliber not so much....I would be open to revolvers. I've already been there and done it with Glock. I am just not a fan. Second Bersa Thunder 380. Actually I have the Plus, which carries 15 rounds. It is just a bit, tiny bit thicker in the grip than the single stack Thunder. Shoots well. I wanted to like the RAMI, but just didn't fall in love with it. Love my P-07! I do really like the RAMI, but if I just gotta go with something thinner, SW Shield would be my choice. Very reliable and easy to transfer to even from shooting the larger CZ’s. Hmmm. My opinoon is NOT to let your guard down just because of a qick trip next door. Check out Galco's Undercover Wraps belly band. It will easily accommodate a P07 (of full size 75B for that matter). The belly band supports the gun so you can still wear loose gym shorts or pajama bottoms and T shirt if you want to keep the pants and stiff belt, etc. At home. It has 2 holster pockets to accommodate either a small wheel gun or med/lrg pistol. Don't get me wrong, of course you buy another gun, too! A used Sig P232 will give you small DA/SA, but in .380. My go-to for a small 9mm is the Sig P938, that has 1911-like controls and is a SAO carried cocked and locked. With the 7 round mag, I can just get all my fingers around the grip. Cyanide's first reply mentioning Beretta'PX4sc is very similar in size to the Rami. I have both and they both see SD duty. Even though a stock PX4sc has a safety/decocker, meaning safety still disables the gun in DA mode, it is a simple spring removal to convert it to decock only. 13+1 with flush fit mags or pinlky extension that clicks down (really cool) for full grip. Takes fullsize 17 round mags with sleeve for integrated grip fit if desired. Maybe a tad lighter than the Rami, but a wee bit thicker. I use a OWB high ride leather holster designed for the Beretta for Rami carry and no problems, good retention. 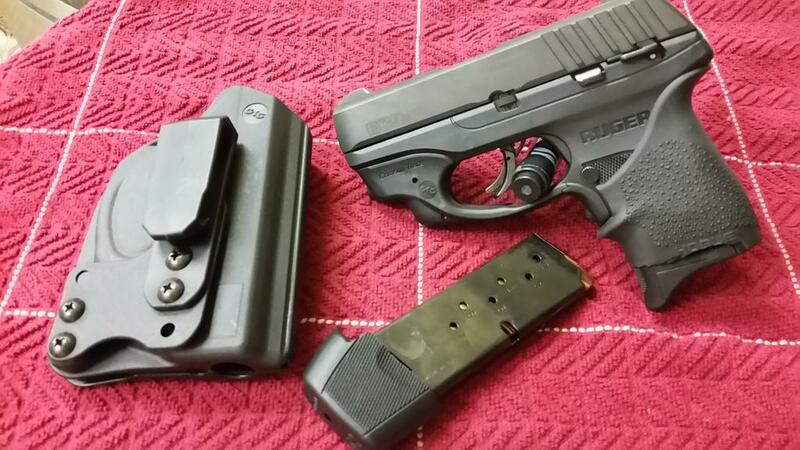 I can't just stick my PX4 in my purpose built Rami holster. The PX4sc has 3 backstraps to suit your hand size and it is of the Browning tilt barrel lock up which I like rather than the rotating barrel designs of the rest of the PX4 series. I have a very difficult time in assessing which one is better! In my opinion, they both shoot like full size guns. However, I have no problems with tucking my pinky finger under the mag. If you need a full grip, the PX4 definitely would get the nod of the 2. That it can also be had in 40 cal--bonus, but perhaps not necessary. Have you looked at the Ruger LCR 9mm? 5-shot compact revolver using moon clips. 2 loaded moon clips fit nicely in a Walgreen's prescription bottle.